Julian Castro is moving to lock up a spot in the Democratic Party's first presidential primary debate following the entry of former congressman Beto O'Rourke, a fellow Texan, into the race. On Tuesday, Castro's campaign sent a targeted fundraising email entitled "humbly asking" soliciting donations from supporters to ensure the candidate snags one of only 20 spots in the first Democratic presidential primary debate. A copy of the email was obtained by the Washington Free Beacon. "I'm not a frontrunner in this presidential race. And frankly, that's fine. I wasn't born a frontrunner," the former secretary of housing and urban development wrote to supporters (as opposed to O'Rourke, who told Vanity Fair, "I'm just born to be in it."). "I made my way up from San Antonio's West Side through hard work and with help from a community that believed in me." "That's how I've lived my life. That's how I'll win this race," he continued. "And that's why I'm asking you to be one of the 200 donors I need from Virginia so I can officially reach the debate stage and get my message out to the American people." In February, with the prospect of having the largest presidential field in history, the Democratic National Committee announced it would limit the number of candidates allowed to take part in its first primary debate to 20. The DNC has created two separate and independent thresholds to determine participation. The first allows a candidate to appear if they reach at least 1 percent in three separate polls, either national polls or those from early primary and caucus states. The second, adopted at the behest of liberals from the Democratic Party's grassroots wing, grants candidates access to the stage if they garner 65,000 campaign donations from individuals in at least 20 different states. Although Castro's campaign never discussed how it planned to reach the debate stage, it appeared likely that his standing in the polls (close to 1 percent) would secure a spot. Likewise, Castro's prior fundraising emails make no mention of the candidate needing help to qualify for the debate, according to documents obtained by the Free Beacon. With O'Rourke's entrance into the race, however, Castro's campaign seems to have decided on actively pursuing the small donations route. The decision seems to reignite lingering questions about whether the presidential field is big enough for two Texans occupying similar positions and competing for finite resources. Castro's campaign did not respond to inquiries for this story. James Dickey, the chairman of the Texas Republican Party, told the Free Beacon that Castro's decision seemed to suggest his campaign was preparing to drop below 1 percent in the polls. 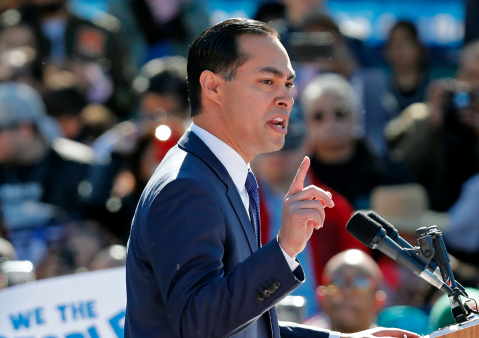 "Julian Castro continues to prove to be nothing more than a far-left Democrat with an even less impressive record than most in the Democrat field. This is saying something considering [Beto's] biggest accomplishment is losing a Senate race," Dickey said. Castro's "inability to distinguish himself shows he takes his candidacy as seriously as America takes him." As previously reported by the Free Beacon, Castro has remained silent on how much his campaign raised in the first 24-hours of his candidacy. In contrast, O'Rourke has touted the $6.2 million raised during his first day on the campaign trail as proof it's "possible to run a true grass-roots campaign for president." This entry was posted in Politics and tagged 2020 Election, Beto O'Rourke, Democratic Party, DNC, Julian Castro. Bookmark the permalink.